Loss of cognitive function often is believed to be a natural consequence of aging, a time during which the brain no longer performs as sharply as it did in an individual's younger years. This line of thinking is analogous to the perception of heart failure in the mid-20th century. The medical community understood the heart's physiology and knew it had the potential to fail, but there was limited knowledge of heart failure's association with lifestyle and nutrition until the Framingham Heart Study, which began in 1948. However, decades of research have proven that healthful dietary and lifestyle choices starting at an early age and continuing throughout the lifespan can greatly increase the life expectancy of the heart and that of the individual. In addition to omega-3s, antioxidants, and phytochemicals, there's significant research interest in the role B vitamins play in maintaining cognitive health.5,6 The B-complex vitamins produce neurotransmitters such as serotonin and regulate energy use in the brain, so it's plausible that inadequate intake could reduce cognition. Folate also donates methyl groups for the production of methylcobalamin, which is involved in the methylation of homocysteine to methionine. When folate intake is adequate, this process moderates homocysteine levels. Low folate consumption leads to an increase in serum homocysteine, which researchers hypothesize is a risk factor for heart disease and is associated with decreased cognitive function in old age.8 This premise is known as the homocysteine hypothesis. Folate deficiency inhibits DNA repair and increases neuron susceptibility to oxidative damage, which could potentially contribute to cognitive decline. Excellent sources of folate include spinach and other dark leafy greens, asparagus, black-eyed peas, lentils, and pinto, garbanzo, and black beans. The folate recommendation for adults is 400 mcg per day though there's some evidence that levels above this may be beneficial. As part of the Folic Acid and Carotid Intima-media Thickness trial, researchers in the Netherlands gave 800 participants either 800 mcg of folic acid or a placebo for three years. At follow-up, the supplementation group scored higher on memory and cognition tests. At baseline, 100% of participants had low folate intake and elevated homocysteine, giving credence to the hypothesis that high homocysteine levels impair cognition.9 While this study used supplements, it's possible to exceed the Recommended Dietary Allowance (RDA) for folate by eating folate-rich foods. Folic acid supplementation should occur under the guidance of a physician, as excess folate intake could mask vitamin B12 deficiency. Low vitamin B12, and therefore high homocysteine, is a concern for those eating a vegan diet because B12 is found only in animal products or fortified foods. Organ meats and sardines are concentrated sources of B12, though all animal foods, fortified nondairy milks, and many meat alternatives are additional sources. Absorption, which is often reduced in older adults, influences plasma levels. Educating older adults effectively about the role diet, nutrition, and lifestyle behaviors play in maintaining cognitive health is paramount, but it's important to keep in mind that it's difficult for older adults to develop new behaviors after establishing certain habits that have spanned many decades. Nonetheless, health professionals can introduce concepts and foods to prolong cognition. When counseling older adults, prioritize food over supplements, with the exception of vitamin B12, because of the possible beneficial synergistic effects among nutrients, phytochemicals, and other compounds found in whole foods. Beans are an excellent source of many B vitamins; they're readily available and easy to incorporate into meals. Whole grains are nutrient dense and contain more fiber and protein than their refined counterparts, but the taste and texture may be difficult for some older adults because whole grains are denser and have increased texture and a more pronounced mouth feel. Refined wheat and rice products in the United States are enriched with the B vitamins thiamin, riboflavin, niacin, and folic acid. While not nutritionally ideal, refined wheat and rice products can aid in meeting B vitamin requirements. Not all older adults have cooking skills or have access to kitchens or cooking utensils, but caregivers or those who work with them can help prepare the following types of meals rich in B vitamins. • Soups and stews. Soups and stews offer excellent ways to incorporate beans and vegetables into the diet. They tend to be nutrient dense, and patients who have trouble chewing or swallowing find them easier to eat. Because many vegetables often are hidden in stews, patients who have a taste aversion to a particular vegetable likely won't notice it in stew. Soups and stews also are good ways to use vegetables that are nearing the end of their shelf life. Lentils are ideal because they don't require soaking and can be cooked until they're soft. • Blended vegetables for sauces. Many vegetables can be lightly sautéed, blended, and added to sauces, such as marinara. This slightly changes the consistency and taste of the sauce, but it could be much more palatable for individuals who have trouble eating whole vegetables. Many of the nutrients and much of the fiber are retained in this cooking style. • Beans and vegetables added to common dishes. Older clients can incorporate beans into salads, pastas, and rice dishes without significantly altering the taste or texture. A common technique used to encourage behavior change is to attach new habits to old ones, and the same can be done with food and nutrition. Recommend patients incorporate vegetables they like into easy-to-prepare dishes. For example, instead of eating spinach only as a side dish, suggest its addition to main entrées. • International cuisine. The United Nations declared 2016 the International Year of Pulses to celebrate the significant impact beans have around the world as a sustainable and affordable source of nutrients for billions of people. Adding international foods to a food service rotation is an easy way to incorporate more beans into a menu. Mexican and Central American cuisines emphasize pinto and black beans, and lentils are integral to many foods from southern Asia. Hummus, a Middle Eastern specialty made with olive oil, tahini, garlic, lemon, and chickpeas, is soft, nutrient dense, and easy for an older adult or food service kitchen to prepare. • Include berries. Popular and readily available, berries such as strawberries, blueberries, and raspberries are nutrient dense and rich in antioxidants and flavonoids, which could be beneficial for brain health.17,18 Berries are soft and easy for older patients to eat and therefore, should be an important part of their diet. Most often people are encouraged to buy fresh berries, but frozen berries are easier to store for longer periods of time and have the same nutrient profiles as the fresh varieties. Patients can eat berries as a dessert or add them to oatmeal or smoothie recipes if they have difficulty chewing or swallowing. • Sip tea. Other than water, tea is the most consumed beverage in the world, and it may be beneficial for preventing cognitive decline.19 In March 2016, the Netherlands Nutrition Centre released its food pyramid and dietary guidelines that recommend the Dutch drink three cups of tea per day. The research isn't extensive, but the antioxidants and L-theanine found in tea may help maintain brain function.20 The caffeine found in tea may be beneficial for cognition,21 but it could be problematic for those who have difficulty sleeping. Recommending tea for older adults otherwise has little risk with potential benefits. Despite the many healthful foods available to help maintain and promote cognitive health, many older adults with limited mobility and resources may not have access to them. Health professionals can work with elder programs, nonprofits, charities, and kitchen staffs in creative ways to increase access to vital foods. For example, Debra King, MS, RD, LD, FAND, director of Nutrition Services for Meals and Wheels in Waco, Texas, accessed a community grant through Meals and Wheels to set up a farmers' market food truck in areas with limited access to fresh produce. Through the grant, discounts are offered to people who use SNAP (Supplemental Nutrition Assistance Program) benefits and to adults aged 60 and older. While there are no established recommendations for B vitamins or other nutrients to protect against cognitive decline specifically outside of meeting the RDA for each nutrient, there's enough evidence suggesting there are problems associated with deficiency or less than adequate intake related to brain health. The B vitamins are common in many foods; therefore, it should be possible for most older adults to meet their needs with food alone. 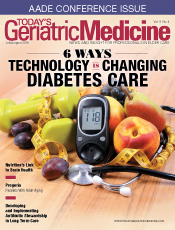 A study published in the March 2016 issue of Nutrients on preventive approaches for dementia concluded there isn't enough evidence yet to recommend specific foods, but that healthful dietary patterns, mainly a diet high in flavonoids and unsaturated fatty acids that meets nutritional needs, are associated with improved cognition.22 As the baby boomer generation ages, more and more older adults will be at risk of cognitive decline, and geriatricians can educate them and the facilities serving them on the importance of nutrition in keeping their brains functioning at their best. — Matthew Ruscigno, MPH, RD, is the past chair of the Vegetarian Nutrition Dietetic Practice Group of the Academy of Nutrition and Dietetics. He's the coauthor of No Meat Athlete and Appetite for Reduction and has a private practice in Los Angeles. 1. Smith PJ, Blumenthal JA. Diet and neurocognition: review of evidence and methodological considerations. Curr Aging Sci. 2010;3(1):57-66. 2. Mosconi L, Murray J, Davies M, et al. Nutrient intake and brain biomarkers of Alzheimer's disease in at-risk cognitively normal individuals: a cross-sectional neuroimaging pilot study. BMJ Open. 2014;4(6):e004850. 3. Valls-Pedret C, Sala-Vila A, Serra-Mir M, et al. Mediterranean diet and age-related cognitive decline: a randomized clinical trial. JAMA Intern Med. 2015;175(7):1094-1103. 4. Huhn S, Kharabian Masouleh S, Stumvoll M, Villringer A, Witte AV. Components of a Mediterranean diet and their impact on cognitive functions in aging. Front Aging Neurosci. 2015;7:132. 5. Morris MS. The role of B vitamins in preventing and treating cognitive impairment and decline. Adv Nutr. 2012;3(6):801-812. 6. Smith PJ, Blumenthal JA. Dietary factors and cognitive decline. J Prev Alzheimers Dis. 2016;3(1):53-64. 7. Luchsinger JA, Tang MX, Miller J, Green R, Mayeux R. Relation of higher folate intake to lower risk of Alzheimer disease in the elderly. Arch Neurol. 2007;64(1):86-92. 8. Forbes SC, Holroyd-Leduc JM, Poulin MJ, Hogan DB. Effect of nutrients, dietary supplements and vitamins on cognition: a systematic review and meta-analysis of randomized controlled trials. Can Geriatr J. 2015;18(4):231-245. 9. Durga J, van Boxtel MP, Schouten EG, et al. Effect of 3-year folic acid supplementation on cognitive function in older adults in the FACIT trial: a randomised, double blind, controlled trial. Lancet. 2007;369(9557):208-216. 10. Haan MN, Miller JW, Aiello AE, et al. Homocysteine, B vitamins, and the incidence of dementia and cognitive impairment: results from the Sacramento Area Latino Study on Aging. Am J Clin Nutr. 2007;85(2):511-517. 11. Kennedy DO. B Vitamins and the brain: mechanisms, dose and efficacy — a review. Nutrients. 2016;8(2):68. 12. de Jager CA, Oulhaj A, Jacoby R, Refsum H, Smith AD. Cognitive and clinical outcomes of homocysteine-lowering B-vitamin treatment in mild cognitive impairment: a randomized controlled trial. Int J Geriatr Psychiatry. 2012;27(6):592-600. 13. Wakade C, Chong R. A novel treatment target for Parkinson's disease. J Neurol Sci. 2014;347(1-2):34-38. 14. Hayes SM, Alosco ML, Hayes JP, et al. Physical activity is positively associated with episodic memory in aging. J Int Neuropsychol Soc. 2015;21(10):780-790. 15. de la Monte SM, Wands JR. Alzheimer's disease is type 3 diabetes — evidence reviewed. J Diabetes Sci Technol. 2008;2(6):1101-1113. 16. Ahmed S, Mahmood Z, Zahid S. Linking insulin with Alzheimer's disease: emergence as type III diabetes. Neurol Sci. 2015;36(10):1763-1769. 17. Keservani RK, Sharma AK, Kesharwani RK. Medicinal effect of nutraceutical fruits for the cognition and brain health. Scientifica (Cairo). 2016;2016:3109254. 18. Miller MG, Shukitt-Hale B. Berry fruit enhances beneficial signaling in the brain. J Agric Food Chem. 2012;60(23):5709-5715. 19. Ide K, Yamada H, Takuma N, et al. Green tea consumption affects cognitive dysfunction in the elderly: a pilot study. Nutrients. 2014;6(10):4032-4042. 20. Einöther SJ, Martens VE. Acute effects of tea consumption on attention and mood. Am J Clin Nutr. 2013;98(6 Suppl):1700S-1708S. 21. Arab L, Khan F, Lam H. Epidemiologic evidence of a relationship between tea, coffee, or caffeine consumption and cognitive decline. Adv Nutr. 2013;4(1):115-122. 22. Canevelli M, Lucchini F, Quarata F, Bruno G, Cesari M. Nutrition and dementia: evidence for preventive approaches? Nutrients. 2016;8(3):144.